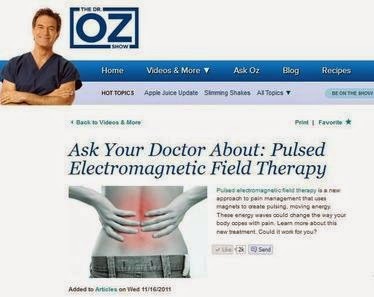 I have been using a PEMF device, after seeing Dr. Oz rave about how it can improve your overall health. Studies show that as we age, the mitochondria in our cells become less able to produce energy, and therefore, the quality of our eggs naturally goes down. You can read more about that in this post. Well, guess what.... PEMF (at the right frequency) is shown to help the mitochondria produce more energy! Maybe there's a way to "turn back the clock" after all! I have to say, I've definitely noticed a difference in my cycle since using PEMF. My cycle seems to be longer, and the last time I got my period it even lasted a full week (as opposed to the 5 days I was getting used to). Which I guess is good and bad, right... but if it's a sign I could be turning back the clock, I'm all for it. Also, when I get my period, it's more of the "bright red blood" than the "dark blood" I was getting used to seeing. I got the following information (in green) from this guy who has been using the The Earth Pulse Machine (which I highly recommend) for many years (you can see this same info on his videos). I'm posting one of his videos below. His testimonial is pretty amazing. 2) determining cell aptosis (programmed cell death related to the loss of mitochondrial integrity). David A. Hood, York University, discovered mitochondria have resonant frequency of 10 Hz. If stimulated at 10 Hz for several hours, the mitochondria improve their integrity, function and efficiency; thereby delaying programmed cell death. In 2003, NASA research proved that a 10 Hz pulsed magnetic field turned maturation genes "off" and developmental genes "on." The EarthPulse "Recover Mode" uses a 10 Hz pulsed magnetic signal and results in extraordinary rejuvenation effects. This is the guy who developed the Earth Pulse machine (pic on the left) and wrote the info (above) on his video. According to the video below, he is in his 50's. I'd say his body looks pretty damn young for someone in his fifties. "I smoke a pack of natural tobacco non filtered cigarettes per day (sometimes more), and don't surf or play golf nearly as much as I'd like to. My SAO2 is 99%, I can hold my breath for 2:30 seconds, swim 50 meters under water (diving off one end) and mostly I'm chained to this desk much of the time. EarthPulse™ makes aging a cake-walk." Imagine how much better of he would be if he just QUIT SMOKING! (Ugh - i hate cigarettes). Here is his video (which also features his dog, who has an INCREDIBLE amount of energy for a 15 year old dog! You can see another pretty cool testimonial from Health & Fitness Expert Ben Greenfield, HERE. PEMF machines range in price from $150 to $20,000. I'd recommend the Earth Pulse Machine to any woman who is TTC (because it has great reviews and is affordable). But please note, you shouldn't use PEMF once you BECOME pregnant...but I would highly recommend it for improving your health beforehand. Basically, this machine just makes your body more in line with natural frequencies produced by the earth. I know it sounds nutty but I've done a lot of research on it and I can tell you that PEMF therapy really has helped improve my overall health... which in turn, may improve fertility. You can read about it yourself... I would encourage everyone to check out the reviews for his machine. If you want more information on the PEMF units I have, just contact me via the form on the right.